Several years ago I blogged about my Healthy Oat Pancakes, and those are still a staple breakfast for me. But I’m about to be travelling abroad for an extended period of time (more about that in another post soon) where I will have a kitchen but not my kitchen with my tools. That matters for anyone used to cooking. Further, I’ll be taking my older daughter around to museums and other places – dragging the one year old around with us – so I’ll have to be up and ready to go many an early morning, all without a car for the most part. Since I’m certifiably allergic to mornings (that is totally a thing, I swear) and since I have a medication I have to take when I get up and then can’t eat for an hour, I’m going to want to grab breakfast while on the train. Portable food tends to be very high carb, which is bad for me as a diabetic. Protein just doesn’t travel well. I need something that is filling, has minimal refined carbs, won’t spike my blood sugar, and is easy to eat on the go. Oh, and something I’m willing to eat, since I’m generally not keen on food in the morning at all and a fussy eater in general. I thought, “If only I could take my favourite pancakes without that being gross or weird.” And then it occurred to me that pancakes and muffins are pretty much the same thing other than cooking method (or sometimes a slight adjustment in liquid amounts). So I just tried whipping up my pancakes as muffins, and it worked! Upcoming breakfast issue solved! 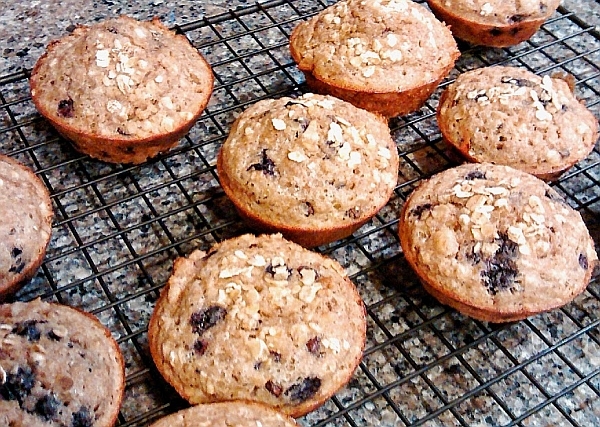 The sprinkled oats on top cancel out the chocolate chips inside. That’s just basic science. Yes. The best part in terms of blogging is that – just like the original pancakes – you can easily tailor these to your preferences. Check out the chart on the original post for ways to change these to suit your needs. Preheat oven to 375F and prepare a standard muffin pan with baking flour spray or paper liners. Mix all of the dry ingredients in a large bowl, including any of the Optional Mix-Ins. In a separate bowl, microwave the butter just enough to melt it. Add the milk to the butter, then microwave again until the butter re-melts (do not overheat!). Add the eggs and beat the liquid mixture together. Pour the liquid mixture into the dry and mix with a fork until blended, but do not overmix. Distribute the batter equally amongst the 12 muffin cups. If desired, sprinkle extra oats on top. Bake for 15-17 minutes or until you can see the edges turning brown in the cups. Cool for a minute or two in the pan, then remove and cool fully on a wire rack (if you can resist eating them all right away, that is). I made mine tonight using a scant handful of mini chocolate chips, a bunch of mini frozen blueberries, and the last of a bag of chopped walnuts (otherwise I would have added more). I don’t even measure those items beyond the “yeah, that looks good” stage. Moist and tasty without being overly sweet. Perfect for breakfast on the go. This entry was posted in Breakfast, Food Issues, My Recipes, Other Food. Bookmark the permalink. Looking so delicious one and I love it a lot.